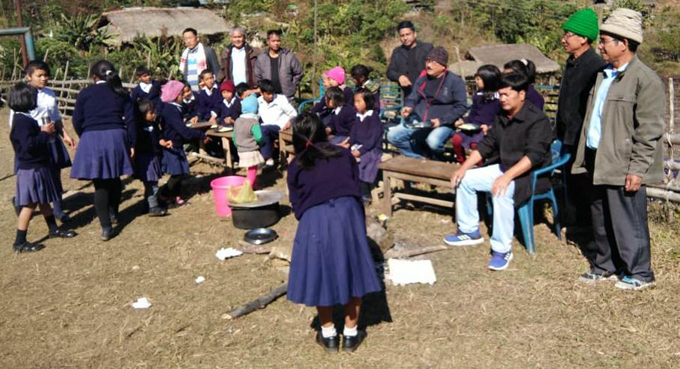 During an inspection of schools in Arunachal Pradesh, a team of high level officials of the Education department found irregularities and ghost students in various schools of the State. West Siang Deputy Director of Secondary Education (DDSE) Eto Ete accompanied by Block Education Officer Kento Ngomdir and several other officers of the Education department undertook a three-day inspection of schools. During the inspection the officials took stock of the implementation of the Mid Day Meal (MDM) and Chief Minister’s Samast Siksha Yojana (CMSSY) schemes. The team visited 19 schools falling under the Liromoba, Yomcha, Darak and Kamba circles. During the inspection tour, teacher performance was examined, implementation of CMSSY and MDM was scrutinised and student enrolment verified. The team also interacted with the villagers, teachers, non-teaching staff and students. It was observed that despite communication bottleneck and inhospitable terrain, some teachers and non-teaching staff members of the department were giving their best to impart quality education although lots of irregularities were also detected among the staff members. The rampant practice of furnishing inflated figures on enrolment was found in the schools. The erring officials will be taken to task, the team members said. The team found the girls’ LP schools at Daba Gamlin, Kela Ronya, Sari Likar, Gadmesi, Tego Gamlin, Belo, Kadai and Kerse Kerte under Yomcha-Liromoba educational block to be completely non-functional since the beginning of the academic session 2018-19. The DDSE said the teachers posted in these schools have been drawing salary and the school incentives including MDM but they failed to report the status of the school being defunct. “These teachers will be immediately withdrawn and posted in other schools. Regular teachers will be penalised for regularising the period of absence with earned leave while the pay of contractual teachers would be deducted as per the ‘no work, no pay’ norms,” Ete said. It was also been observed that the implementation of MDM in the schools of Liromoba and Yomcha was quite unsatisfactory. No records of receipts and feeding of MDM were maintained. It was reported that the Block Resource Centre and Circle Resource Centre Coordinators seldom visited the schools which may be the reason for inflated figures in the enrolment. The services of the BRCC and CRCC in furnishing school district management information system and unified district information system for education were also found totally neglected and irresponsible. These data capture format submissions are time-bound programmes for data uploading to acquire school incentives like MDM food grain and conversion cost, school grants, maintenance grants, children uniform, Vidhya scheme, sanitary hygienic scheme for girl child, etc. It was further informed that the teachers who were found absent without permission during the day of inspection would be issued show-cause notices and those who were reported to be absent for a longer period will be made to regularise their earned leave from their account. The pay of contractual teachers will be deducted for the period of their absence, the DDSE informed.